From increased regulatory requirements, to a demand for more environmentally-friendly materials and restriction on additives, formula-based manufacturers have more consumer-driven product criteria and compliance thresholds to track on a global level than ever before. Using physical means and disconnected systems just won’t cut it to get quality, cost-efficient products to consumers quickly; Process-based industries need a comprehensive Formulation & Recipe tool to optimize R&D processes and react to modern consumer preferences. Devex offers an easy, intuitive interface that provides a single point of truth for formulation development. By capturing formula modifications, approvals and activations in one place, your R&D, Quality Control, Procurement and Regulatory teams can all use one seamless process to rapidly develop products for today’s market. Using Devex PLM, Research and Development teams can digitally model how different combinations of product attributes impact final product composition, cost and compliance prior to physical trial testing. Compare formulation factors against predetermined limits for cost, compliance, additives and more to find the best combinations prior to sample creation. Generate exact cost outputs for different possible formulation versions, base percentages, chemical properties and more. Access and use past formulation data with a centralized database of all recipes and formulations. Use integrated data from ERP and CRM systems to make decisions across departments quickly. Protect intellectual property rights with controlled formulation access. Streamline raw material procurement with the Supplier Collaboration Portal. Send standardized, web-based questionnaires to digitally collect product data from vendors. Send reminders and track the progress of both past and present supplier questionnaire submissions. Directly integrate supplier raw material data into trial and final recipe formula specifications for more efficient formula data management. Maintain rapid formulation reviews and approvals with all-in-one formulation specification templates. Auto-populate classification fields across multiple formula specifications. More efficiently promote Trial Formulations to General and Final Formulations with structured approval workflows track when each department takes actions. Build quality and regulatory data fields directly into formulation specifications. Create multiple ingredient statements and Nutritional Fact Panels in the local languages for all the different markets in which your product will be sold. Reduce manual data entry and create more precise product formulation calculations. Use roll-up formula calculations to ensure the accuracy of multi-layer product formulations. Standardize units of measure for disparate ingredients and materials sourced and used throughout the development process. Set the right formats and limits for material classifications. Easily integrate data from multiple systems into product formulations. 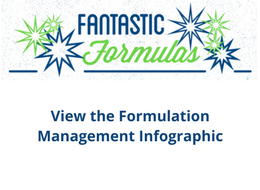 See the entire history of formulas with Formula Timeline View, connecting specifications and multi-layered formulas together into a master view of formulation choices. Provide secure access to different formulation versions in a centralized database. Centralize all documents in a material master into one system and use version control to track product changes over time. Find formulations by keywords, calculated values, amounts used, vendors, creation/modification dates and more. Create more informed, cost-effective research choices and significantly reduce R&D timelines from the very start. Get a global single version of product data with centralized formulas and recipes. Quickly model how changes to cost, ingredients and other parameters will affect final products at every stage of the development process. 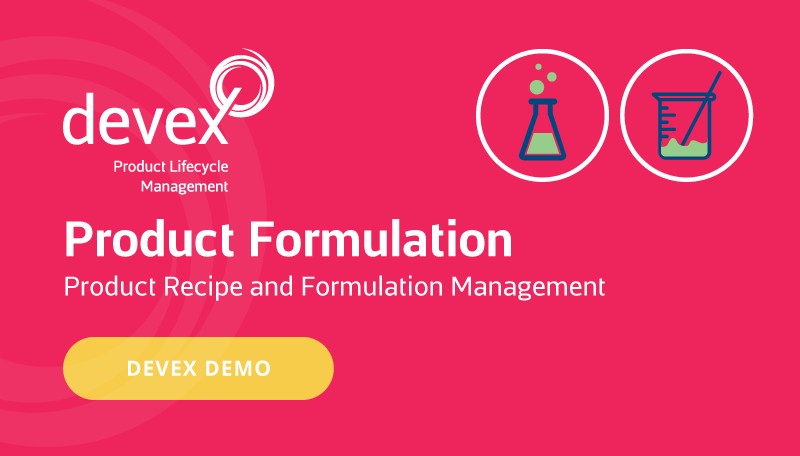 Efficiently promote formulas from trial to final versions while retaining a full history of formulation changes. Perform accurate cost analysis prior to trial testing. Standardize product data fields across processes, software systems, vendors, and control points. Increase speed to market to more competitively meet new consumer demands. Connect R&D formulation development to Quality, Regulatory and Production processes.